For years, Ernest’s life was going along smoothly. Happily married with children and grandchildren, he was running his own company and playing golf and skiing in his free time. Life was good. One day, he became very agitated after a flashback and it scared his grandson. It was at this moment, he knew he needed help. He reached out to counselors at the Veterans Administration and learned about a program with Fieldstone Farm. He remembered his days growing up on a farm, as the oldest of five kids in Georgia, and became intrigued. 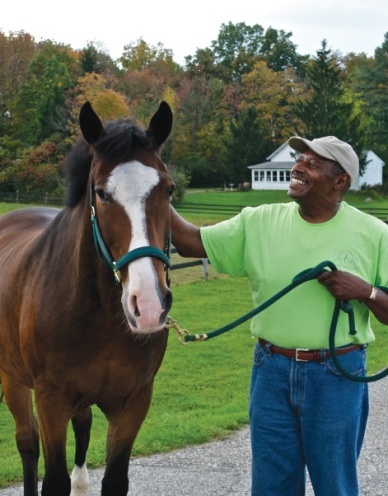 He enrolled in the program and spent two sessions working with our horses and counselors from the VA.
Now, Ernest is giving back to veterans just like him and is a volunteer at Fieldstone Farm in both the riding and carriage driving programs. He wants to help other veterans find confidence, courage and independence, like he did. He recalls how he saw a triple amputee hold the reins while carriage driving, and what joy it brought to both him and the other veteran.